We tried two of the five, yes FIVE, options that are available to choose from. We had the Buffalo Cauliflower Bites a Gluten Free, Vegetarian option with Spun Carrots & Shaved Celery, Blue Cheese Crumbles, and a Buttermilk Garlic Dressing. There was definitely enough to share. We also tried Fried Green Tomatoes that consisted of Creamy Pimento Cheese, Crispy Pork Belly, and House-Made Tomato Chutney. This southern dish was packed full of flavor. The Pimento Cheese was fantastic! For our entree we ordered the Spicy Italian Sandwich with Prosciutto, Peperoni, Peppered Salami, Pepperoncini Olive Slaw, and Spicy Mustard. The sandwich was filling and had just the right amount of bite. If you love deli sandwiches this one is a must try! The other entree we tried was the Thai Spiced Beef Tenderloin Salad which is Gluten Free and full of Chopped Romaine, Bell Pepper, Red Onion, Cucumber, Tomato, Edamame, Fresh Sesame Ginger Vinaigrette, and Horseradish Cream. We were blown away by the flavor and tenderness of the beef! This is currently a Restaurant Week exclusive, but we are hoping that they add it to the regular menu. We had a great lunch experience and are looking forward to going back to try out the dinner menu. 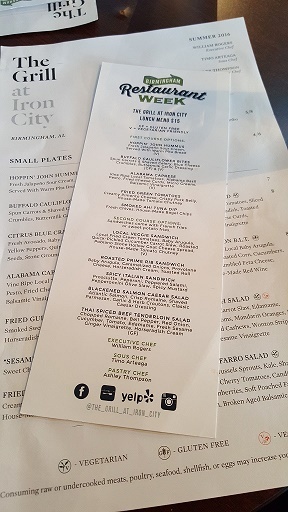 If you work downtown, The Grill at Iron City is a great lunch option that is both tasty and filling!